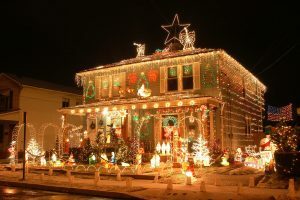 No matter what holidays you celebrate, if you take the Clark Griswold approach to decorating your home’s exterior–that is, every nook and cranny trimmed in lights and holiday cheer–you need to keep safety top of mind. The most recent data from the U.S. Consumer Product Safety Commission estimates more that 15,000 injuries related to holiday decorating were seen nationwide in emergency departments between November and December 2012. Injuries included falls, lacerations, and back strains. Fire department response is also on the rise during this time of year due to such issues as faulty wires and overloading of electrical sockets. To keep your holidays merry and bright, follow these safety-first decorating tips. 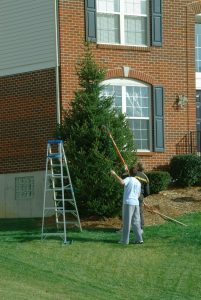 Always use the proper ladder type and height when hanging outdoor decor. Don’t use makeshift risers, such as stacked patio furniture or plant pots, to give you the leg up you need. Wear dry, slip-resistant footwear on ladders to avoid falling while ascending and descending. When hanging decor over doorways, lock or hang a sign on the opening to avoid being knocked off your ladder by another person. Follow the manufacturer’s instructions for ladder use, never climbing above the recommended rungs, and always making sure the correct points of contact are made with the ground. If bad weather moves in, including rain, heavy winds, and snow, put the ladder-required decorating on hold. Check the Underwriters Laboratory (UL) label to make sure you are only using outdoor lights outside. Before hanging lights, inspect for frayed or bare wires, loose connections, and cracked sockets. Repair damage or replace light sets before using. Fasten outdoor lights using hooks or insulated staples–never nails, tacks, or other materials that can stress the wires. Only plug outdoor lights into ground-fault circuit interrupter (GFCI) sockets. Don’t overload electrical sockets, and follow manufacturer recommendations when connecting multiple lights end to end. Keep lights and extension cords off the ground, avoiding standing water and snow. Steer clear–at least 10 feet–of hanging decorations near power lines. Set timers to make sure outdoor lights are only on when you are home and awake. When putting up and taking down decorations in cold weather, dress properly with gloves, hats, and layers, to avoid frostbite and getting sick. 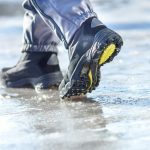 Watch out for icy areas around the home. If needed, lay down salt or sand, and make sure gutters are clear. Avoid overexertion when working in the cold. Take things slow, listen to your body, and drink plenty of fluids. Even in the winter, you can become dehydrated.